The nail station is a trolley with telescopic handle, light to carry and fast to open, thanks to the integrated telescopic legs. Thanks to the padded waterproof bag, which leaves uncovered wheels and handle, the nail trolley will be perfect during all your travels. The station can be customized with your logo or a phrase. You can choose this option when purchasing the product. If you choose the printing of your logo on the product, it takes 3 days more since the reception of your vectorial logo. Find out more about the elements composing this complete mobile nail workstation! Waterproof protection bag for the nail suitcase. This bag is made of padded, black textile. It easily slips over the trolley without lifting. 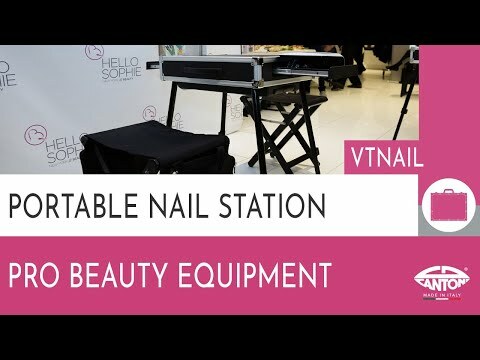 This portable workstation with stools is conceived for nail artists who work on the move. The nail workstation is ideally completed by BB2.N beauty box, in which you can organize and move everything you need for the nail care. This BB2.N beauty case, thanks to the special flap, perfectly fits in the handle of the VT NAIL trolley: you can carry all using just one hand!